Want something a bit different? 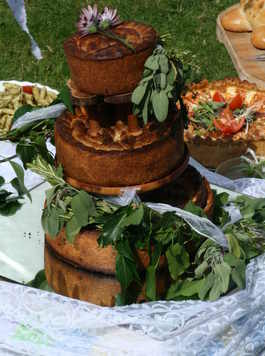 Why not try our pork pie wedding cakes? A perfect alternative for couples who prefer savoury to sweet and a great talking point for your guests! Another great option if you're not into cake. Try three tiers of your favourite cheeses or a mixture of tiers, some pork pie, some cheese. Contact us for more information. Want to keep your costs down? Why not do it yourself? It's easy! We can provide you with the roast pork, our homemade stuffing, apple sauce and bread rolls all hot and ready to serve - you just come and collect it from us and serve it yourself. It generally works out much cheaper and you still have very little work to do. We use lean legs of pork, our homemade stuffing, homemade apple sauce, and fresh bread rolls, and for an extra 60p per head you can add sausages too. We provide everything hot, in hotboxes (where it will stay hot for several hours) and you just need to collect and return the hotboxes. Delicious! If you are catering for more than this, please call us to discuss prices. Please note that we cannot currently do DIY Hog Roasts for Sundays or Bank Holidays. For more information about our DIY pig roasts or to book please call us on 01604 847214 and we will be happy to discuss your requirements. We have five catering trailers for large scale catering at events such as fairs, shows or sporting events. We have many years of experience, too, having catered for all the home rugby matches at the Northampton Saints ground for years and more recently, for high profile events across the country from Twickenham and Wembley Stadiums to music festivals like Download or Creamfields. From catering at the Olympics to feeding hungry sports fans we can cater just about anywhere! For more about our events catering, please visit our dedicated events catering page.